Students will be assessed in their proficiency on course learning outcomes, multiple choice assessments, and spoken and written responses to course-specific prompts. 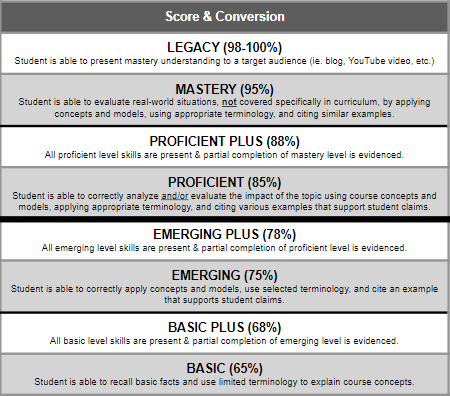 Activities (30%): Students will be graded using a proficiency scale rubric for specific unit activities. Students will need to score at least 85% for each learning outcome. ​Exams (30%): Students will take multiple choice exams during each unit. Speaking and Writing Assignments (30%): Students will frequently discuss and write about course concepts related to this course. Final Exam (10%): Students will take a full AP Exam prior to the May exam. OVERVIEW: This course is designed to expose and prepare students for college-level work and the AP Human Geography examination in May. The content for AP Human Geography centers around seven major themes presented by the College Board. These themes include: 1) Geography: Its Nature & Perspective, 2) Population & Migration, 3) Cultural Patterns & Processes, 4) Political Organization of Space, 5) Agriculture, Food Production, & Rural Land Use, 6) Industrialization & Economic Development, 7) Cities & Land Use. Furthermore, content within these themes is provided thematically around the disciple’s main subfields; economic geography, cultural geography, political geography, and urban geography. READING EXPECTATIONS: Students entering an AP Human Geography course should be capable of reading and comprehending texts written at the college level to summarize and evaluate textual information. They should also be able to read and interpret maps and graphic data. The ability to perform basic mathematical operations is also useful in this course (AP Human Geography course description, 2015). All readings must be completed PRIOR to the beginning of the week in which it is listed. WRITING EXPECTATIONS: Students entering an AP Human Geography course should possess fundamental skills in composition and inquiry (research). In both short-answer (i.e., one-paragraph) and multi-paragraph essay formats, they should be able to clearly articulate their summaries, analyses, interpretations, and evaluations of information (AP Human Geography course description, 2015).